It is important to define terms in order to understand how to plot an answer when you are bending tube or pipe on a tube or pipe bender. Here is how Hines Bending defines industry terms. Bends Types: 180 degree bends, U-Bends, J-Bends, 1D Bends are terms used to describe bent parts. If you have a sample tube or pipe part that you want to bend available, place the tube or pipe that you want to bend on a large piece of paper or cardboard on the floor. Trace the tube or pipe onto the cardboard, continuing the pattern until you have made a full circle. Measure (in mm or inches) from the center of the tubing or pipe to the center of your drawn circle. This straight line measurement to the pipe or tubing is the centerline radius you want to bend. CNC Bender: Computer Numerically Controlled tube and pipe benders; all CNC benders are 3-axis. CNC Push Bender: A style of bending where the bend arm is moved positive a few degrees, then the tube is pushed through a set of rollers create the bend. This can easily achieve a very large radius bend compared to rotary draw bending. Push bending uses a roller on the clamp die assembly with an opposing roller that is placed where the bend die in rotary draw bender is normally placed. This roller can vary in size compared to the other rollers in the die assembly. Two more rollers of the same centerline radius as the front clamp roller are on the pressure die assembly. All four rollers rotate freely. A 3D-shaping is possible. The profile is guided between bending-roll and supporting-roll(s), while being pushed through the tools. The position of the forming-roll defines the bending radius. To change the bending plane, a pusher rotates the tube around its longitudinal axis. Degree: Angle in degrees when the tube or pipe bend is formed. (e.g., 45 degrees of tube or pipe bending, 90 degrees of tube or pipe bending, or 180 degrees of tube or pipe bending). 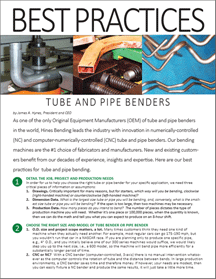 Dual Stack: When two different bend radii are required on the same piece of tubing or pipe. Easy Way (EZ): This is bending the workpiece on its short side during the bending process; bending of a rectangular tubing or pipe. Hard Way (HW): Bending of a rectangular tubing or pipe. This is bending the workpiece on its long side during the mandrel bending process. it is cooled by forced air or water spray, or it may be allowed to cool naturally at ambient temperatures. J – Bends: J bends are normally tubes or pipes that have tight radius bends for the exhaust industry. Exhaust headers use J bends. Mandrel Bending of tubes and pipes require tight radius bending for truck exhausts. Leaf Style Bending Dies: Using Square or rectangular bending dies for pipe or tubing, Leaf Style dies are an easy way to remove the tubing or pipe that has been through the bending process. The leaf built in to the bending dies can easy remove the tubing or pipe from the bending die with little effort. Mandrel Bending Dies: Tube and pipe bender dies designed specifically for tubing and pipe that need a mandrel for supporting the inside of the pipe or tubing being bent together with a wiper die to keep the inside of the tubing or pipe being bent smooth on the inside as well as the exterior of the pipe or tubing going through the bending process. Mandrel Extractor: Device attached at the rear of a mandrel bender to remove the mandrel after the bending of the tube or pipe has taken place. While the tube or pipe has finished the bending process and still has the clamp die holding the tube or pipe, the mandrel is extracted from the workpiece. Minimum Tangent: The minimum straight portion of the tubing or pipe you are bending required by the tube or pipe bender to form the bend and maintain the shape of the pipe or tubing being bent. 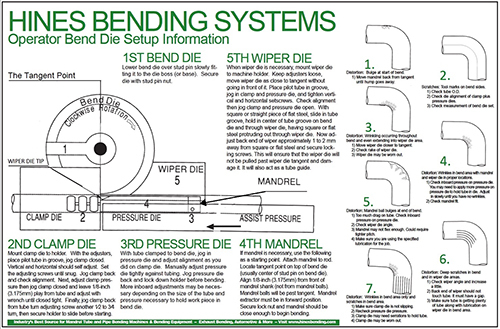 NC Bender: Numerically Controlled tube and pipe bending machines. Rotary Draw Mandrel Bending Direct Die Actuator: This is an accessory that when bending shapes will allow the bending die to split in half to release the tubing or the pipe that is being bent. It is used quite often when bending tubes and pipes in the exercise equipment business as well as many other applications. Stack Dies: Used when two different bend radii are required on the same piece of tube or pipe in a CNC pipe and tube bender application. Tangent: The straight portion of tubing or pipe on either side of arc that is being bent. Normally it will be the section of the pipe or tube that you are bending that is in the clamped area. Typical materials used in bending: Aluminum thin and heavy wall pipe and tube, stainless steel thin and heavy wall pipe and tubes, copper pipe and tubing thin and heavy wall, chrome molly pipe and tube heavy and thin wall, aluminized pipe and tube, heavy and thin wall, many other carbon steel alloys of pipe and tube not mentioned. Wall Thickness: The thickness is in mm or inch measurement of the tube or pipe being bent, whether it is round tubing, square tubing, heavy or light wall or rectangular pipe or tube being bent. All and any other shapes of pipe or tube that will need some type of bending. 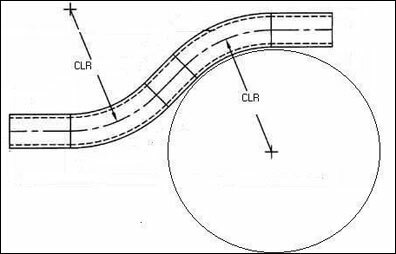 SHOWN ABOVE: FIGURE 1 ILLUSTRATES HOW TO DETERMINE THE CENTERLINE RADIUS (CLR); SEE DEFINITION FOR INSTRUCTIONS. FIGURE 2 ILLUSTRATES HOW TO DETERMINE THE TUBE RADIUS CLR.